In anticipation of the upcoming movie, “Real Steel”, I was sent some cool and interesting facts about the movie, starring Hugh Jackman and Dakota Goyo. “Real Steel” is about a former boxer (Hugh Jackman) who, against all odds, gets one last shot at a comeback when he teams up with his estranged son (Dakota Goyo) to build and train the perfect contender for the new high-tech sport of robot boxing. “Real Steel” is set in the near future, where robots have replaced boxers in the ring, and is directed by Shawn Levy (“Night at the Museum,” “Date Night”). “Real Steel” stars Hugh Jackman (“X-Men Origins: Wolverine,” “The Prestige”) as Charlie Kenton, a financially strapped, risk-taking former boxer who now makes his living on an underworld robot boxing circuit, operating the metal pugilists that made his human profession obsolete. In addition to their distinctive personas, every robot has a specific sound personality. When a robot lands a punch there’s a sound specific to his skeletal material, his mechanisms, his bulk and his mass and there’s also an aura sound so that just merely by being turned on every robot has a whir or a whoosh or an engine hum or the sound or a computer. Evangeline Lilly (“Lost”), who plays Bailey, never saw herself making a boxing film, but when she read the heartfelt script she was won over. Toronto-native Dakota Goyo was chosen from thousands of 10-year-old boys who auditioned for the role of Max, Hugh Jackman’s on-screen son, as part of an international casting search. Filming the robot boxing scenes was done with both motion-capture technology and practical-built, full-scale robots. The motion-capture elements were performed and shot months earlier on a stage in Los Angeles. Fighters were put in the ring wearing data-capturing jumpsuits and as they fought, their motions were converted into robot avatars in the computer and instantaneously appeared on the monitors on set. Then, during principal photography, the filmmakers lined up their cameras on an empty ring and the motion-capture data streamed through their cameras, allowing them to watch and frame the robot fighting in the ring in real time. Sugar Ray Leonard was hired by the filmmakers to serve as the film’s boxing consultant and to train Hugh Jackman for his appearance in the ring. “Real Steel” costume designer Marlene Stewart created a wardrobe for Hugh Jackman’s character Charlie that was inspired by looks from the 1960s, drawing from rugged Americana styles. Even his sunglasses are retro. 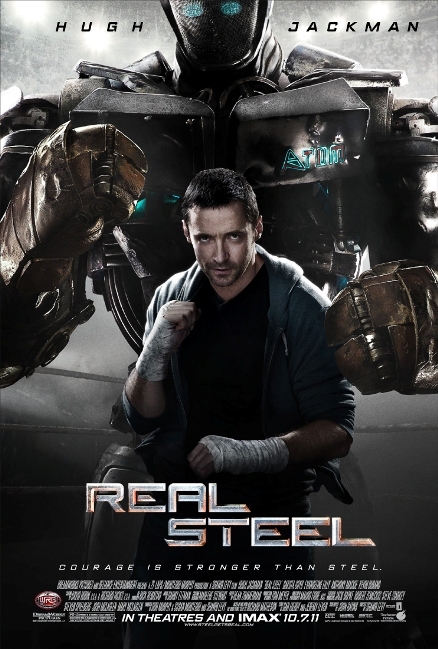 In “Real Steel” there is a clear delineation between the two worlds of robot boxing. There is the official league (the WRB); it’s corporate sponsored, with big money, sanctioned venues and strict rules. Then there is the underworld, which has unsanctioned venues, with no rules, no restrictions—the robots fight to the death. I loved Hugh Jackman in basically all of his movies so this one is right up my alley. It’s rated PG-13 so my whole family can see this with no problems. Are you excited as I am to see Real Steel in theaters? I’m looking to seeing this movie. It looks like it will be pretty good.